Boas capture their prey, which includes mice, hamsters, pigeons, chickens, rats, guinea pigs, and rabbits, by ambush rather than by pursuit. These snakes wrap themselves around their prey, and as the prey breathes in, the constrictor tightens its grip. The boa slowly suffocates its prey. 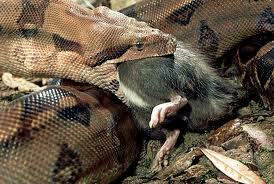 Once the prey is dead the boa swallows it whole and usually head-first. It will then swallow the prey whole, and usually headfirst. Prey is eaten headfirst because it makes it easier to swallow fur and appendages.